In our continuing efforts to offer the highest quality veterinary medicine, we are pleased to provide a wide range of surgical services for our patients. From routine surgical procedures, such as spaying and neutering, to more complex surgeries, cystotomies, and enucleations we look forward to the opportunity to care for your pet's surgical needs. ​An important part of any surgery is maintaining sterility. In this video, Dr. Shutes is aseptically preparing his hands and forearms for surgery prior to gowning and gloving for the procedure. This procedure is done for every surgery performed at Petsburgh to maintain the highest of standards and cleanliness in our surgical suite. 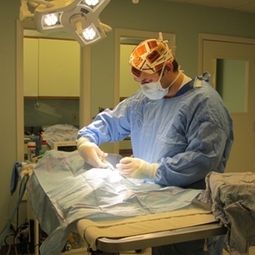 Why Have Surgery With Us at Petsburgh Pet Care? With the wide variety of veterinary clinics and services around, we are proud to believe Petsburgh Pet Care provides the best medical care for your beloved pets. When exploring your options of spay and neuter facilities, be sure to ask key questions of how your pet will be cared for. Inquire about safety protocols, anesthetic protocols, pain control, pre-anesthetic testing and post-operative care. With this information, you can make an informed decision for your pet. Pre-surgical examinations are performed on all anesthetic patients prior to induction. This allows the doctor to listen to the heart and lungs prior to surgery to check for any abnormalities like heart murmurs or congestion. Pre-surgical bloodwork is evaluated which includes a complete blood count, chemistry, heartworm and tick born disease testing (dogs), infectious disease testing (cats). This gives us an idea of your patients’ overall health prior to anesthesia. A complete blood count allows us to screen for anemia, dehydration, and infection. The chemistry panel evaluates organ values which are vital in metabolizing and eliminating the medications used, and together they allow us to screen for underlying diseases that may cause a risk for anesthesia. A multimodal anesthetic protocol is tailored for each individual’s needs based on a variety of factors like bloodwork, procedure, and overall health concerns. Intravenous catheters are placed on all anesthetic patients over 7 years of age. Intravenous catheters are also placed on other patients at doctor discretion based on length and type of procedure, overall health. Fluid therapy is provided at doctor discretion. Every pet’s surgery is done in an proper surgery suite with aseptic instruments. The doctors perform an aseptic sterile scrub and don a cap, mask, gown and gloves to ensure sterility. A Registered Veterinary Technician is with your pet from induction to recovery. They perform vital nursing care and anesthetic monitoring utilizing state of the art machines as well as the best equipment around—their eyes and ears. Any pet under general anesthesia is intubated with a cuffed endotracheal tube to ensure a patent airway and prevent aspiration should the patient regurgitate. While under anesthesia, your pets’ vital signs are monitored closely. This includes monitoring their heart rate and waveform using an electrocardiogram (ECG). Their respiration rate and effort, oxygen saturation, perfusion and ventilation are monitored using pulse oximetry and capnography. Their body temperature is closely watched and they are provided with heating elements to maintain a normal temperature. Blood pressure readings are monitored every 5 minutes in surgery. Change can happen in seconds and these highly trained veterinary nurses are ready to react appropriately to keep your pet as safe as possible. Pain control is provided to all patients undergoing surgery or dentistry as these are inherently painful procedures. Medications are administered prior to surgery and the patient may be sent home with medications depending on the procedure to ensure patient comfort and healing. Detailed discharge instructions are provided with every owner explaining the aftercare they should provide for their pet. Should any questions arise, our trained and skilled staff is here to help. Suture removal and recheck appointments are honored at no charge to the patient. A dental courtesy examination can be done for owners who need an estimate provided prior to a dental procedure. Included on the estimate are dental radiographs. A large amount of dental disease is found below the gumline, and dental radiology allows us to evaluate the root and bone structures. There may be teeth that need treatment that we will not know about until those radiographs are performed under anesthesia. Estimates on all procedures can be provided as requested. An examination may be needed so our doctors will have the best understanding of your pets’ needs before creating the estimate. Dentals are given before and after pictures of their pets’ teeth so you can appreciate the difference and the severity of the disease. Overnight stays are offered at no charge to abdominal and orthopedic surgeries at doctors’ discretion. This ensures the patient gets a quiet night of strict cage rest and can begin healing before going home. Petsburgh Pet Care has a compassionate team of doctors, registered veterinary technicians and veterinary assistants who will be sure to give your pets lots of love!